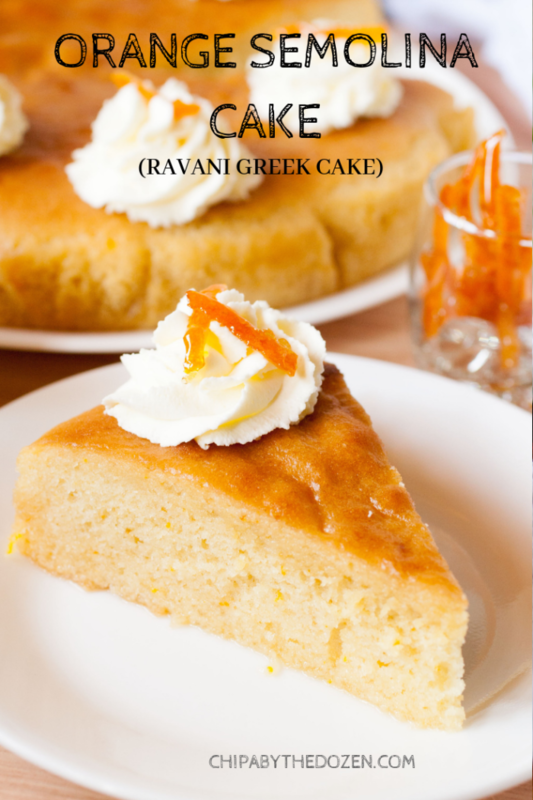 This Greek semolina cake is light, with an intense orange flavor and completely soaked in a honey syrup. I love traveling to other countries through food. Desserts from Greece fascinate me. Phyllo pastries, nuts, and honey. I have a long list of recipes I want to try in the future. 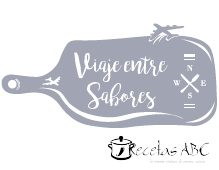 This month we are back on our Traveling Through Flavors challenge, and I chose to make a cake. Ravani or revani has some semolina flour in it, I’ve never made anything with this flour before, so I wanted to try it. It also has olive oil instead of butter, which makes this cake perfect for those who can not have lactose. The cake is light, more like a sponge. The eggs are whisked for 5 minutes along with the sugar to make all those air pockets. Then, the rest of the ingredients are added and the cake goes to the oven. Nothing weird, or complicated. 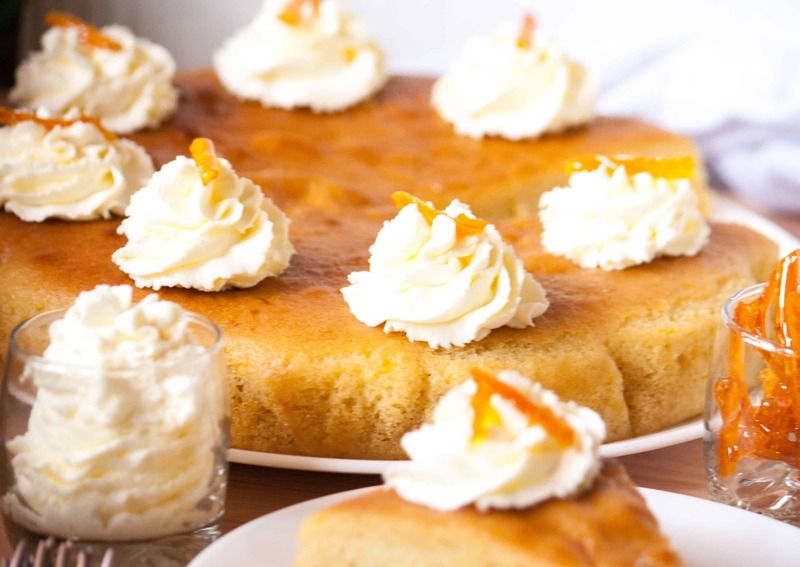 While the cake is baking, make a syrup with more oranges and the characteristic of this dessert, honey. The syrup must be poured while still hot, and the cake must be cold. This step took me a little more time. I poured a little of the syrup, waited until it was absorbed, put in a little bit more, and waited, and then one more time. 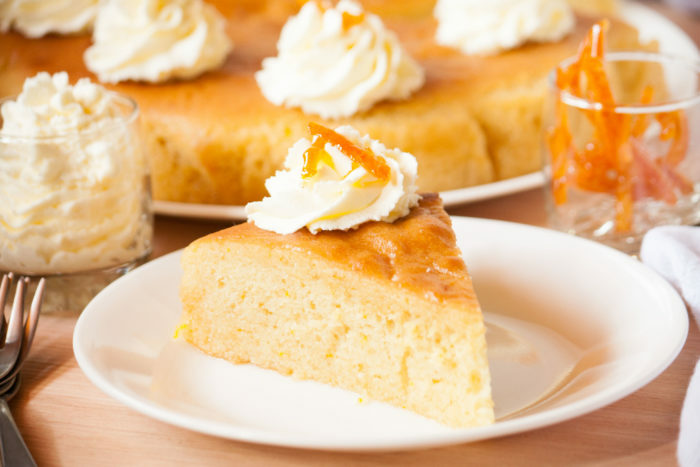 This semolina and orange cake can be served hot or cold. I left mine in the refrigerator overnight, waiting for it to absorb the syrup well. Light and fresh. Perfect for our upcoming summer. Heat the oven to 176C / 350F. Cover a round cake pan (22 or 23 cm.) with parchment paper and grease. In a large bowl, using an electric whisk, beat the eggs and sugar for 3 to 5 minutes, or until it triples in volume. Add olive oil, orange zest and the vanilla. Mix with a spatula. Sift the 2 flours, baking powder and salt. Add half of the flour to the eggs and mix gently. Add the rest of the flour and mix. 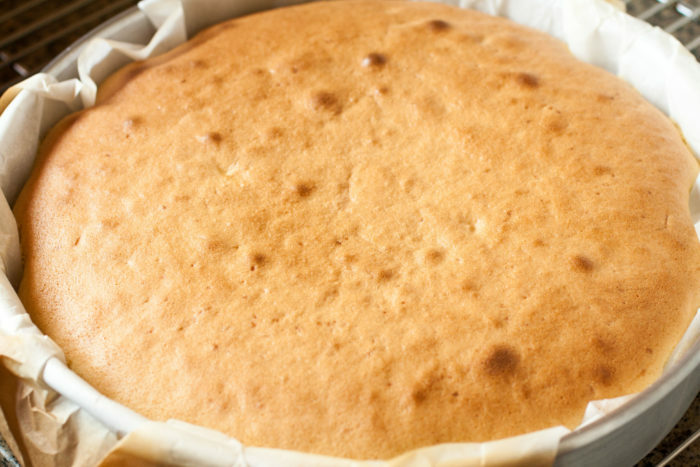 Pour the batter in the prepared pan and bake for 20 to 25 minutes, or until the center of the cake is firm. In a small saucepan add all the ingredients for the syrup. Once it starts to boil, lower the heat and boil for 5 minutes. Keep the syrup hot. Remove the cake from the oven and allow to cool completely. When the cake is cold, pour the hot syrup over the cake. You can serve it hot, or let it cool in the refrigerator and serve it cold with whipped cream or ice cream. You can prick the cake with a fork so that the syrup absorbs faster. You might need to pour the syrup a little bit at a time. Wait for the cake to absorb it, and then add a little more, until the syrup is done. I love anything with orange, and as soon as I saw this recipe, I knew I had to make it! It was so delicious! I’m glad you liked it Tayler! Thanks Traci. I hope you try it. 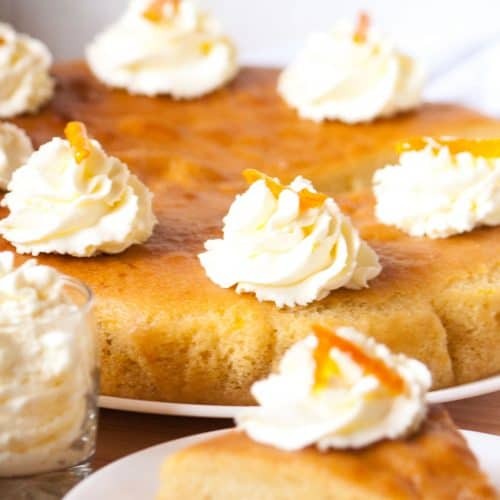 This Greek orange semolina cake looks and sounds delicious. Love the orange flavour! We use semolina flour a lot here in Italy! This sounds so delicious! there is an awesome Greek place near us that has the best desserts and I’ve seen this on the menu but hadn’t tried it yet! Lucky you! you get to try the real thing! This cake looks delicious. I cannot wait to try and make this for dinner this evening. Thanks Jennifer! I hope you like it!